How To Prevent Frostbite During Winter? You are here: Home / Managing Your Flock / How To Prevent Frostbite During Winter? It was Ben Franklin that said ‘an ounce of prevention is better than a pound of cure’. He may not have been talking about chickens at the time, but he was certainly right when it comes to frostbite! The prevention of frostbite is relatively simple and will keep your birds healthy and content. Preventing it in the first place is a lot less work for you and better for your flock, although on occasion there will always be chickens that get frostbitten, despite your best efforts. 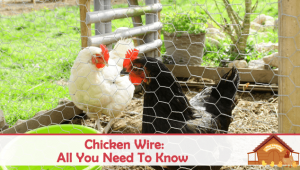 First we’re going to take a look at how chickens get frostbite, and then we will look at some of the easiest ways to treat and prevent frostbite. 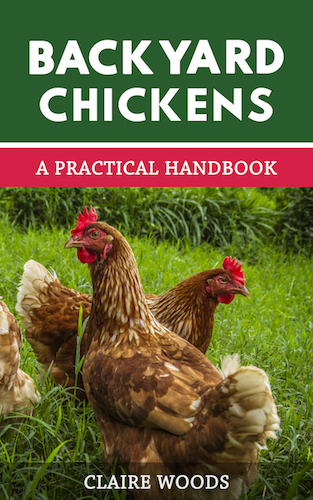 Please read our Definitive Guide To Keeping Chickens In Winter, for more advice about raising chickens during the winter months. Surprisingly, it’s not just the cold- its moisture and the cold which causes frostbite. It can be caused by a variety of things in combination: low temperature, wind chill, length of exposure, lack of shelter, moisture, high altitude and decreased circulation in older birds. Many of these things can be prevented or adjusted- more on that later! In order for the core body of a mammal/bird to stay warm in colder climates, the body decreases the amount of blood flow to the extremities. In humans it’s fingers, toes, ears and noses. In chickens it’s combs, wattles and feet. With the decreased blood flow, the tissues cool down and if they get cold enough, the fluid in and around the cells freeze. This freezing can cause cell death, disruption of the blood supply and creates small blood clots in the affected area. 1st degree: tissue irritation, skin will be soft, white and warm, often referred to as ‘frostnip’. 2nd degree: hard, white skin, skin has a ‘frozen chicken’ feel (no pun intended), swelling, blisters, loss of sensation, usually no residual major damage. 3rd degree: area will feel hard & waxy, swollen, blackening of tissue, necrosis. Permanent damage to tissue and nerves has occurred. Frostbite causes pain, decreased mobility/disfigurement. It can temporarily cause low sperm count in roosters and decreased egg production in hens. 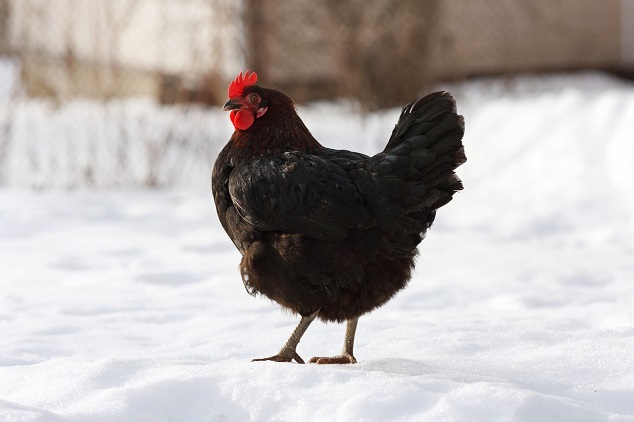 If you think your hen has already got frostbite, then follow this section to learn how to effectively treat frostbite. This section is divided into ‘dos’ and ‘don’ts’. I have tried to give a brief explanation of each with the entry. Immediately move the frostbitten bird to a warmer location for treatment. Gradually warm the affected area. The circulation needs to return to the area slowly. Heating the area rapidly will cause more tissue damage. Start with a lukewarm washcloth slowly working up to normal temperature. This may take some time. Make sure the bird is drinking, especially in the case of affected wattles. You can add vitamins/electrolytes to the water to aid with the healing process. Soak the feet in lukewarm water with Epsom salts one or two times/day for a week, longer if necessary. This will encourage the return of circulation to the feet. The process may take several weeks if the frostbite is severe enough. During their recovery you need to monitor their dietary intake carefully- they need to be eating plenty of food during this period. Finally, watch all affected areas closely for signs of infection or necrosis. If either occurs you should consult with a veterinarian immediately. There are certain things that you shouldn’t do under any circumstances when treating frostbite. Don’t rub the frostbitten area, this won’t help and will be painful for the bird. Don’t use direct heat such as a hair dryer or heat light- it can cause further tissue damage. Do not break open any blisters. The fluid inside is protective and opening them gives a potential entry source for infection. Do not ‘trim’ blackened areas unless they are infected. You should really consult a veterinarian at this point. Here we return to Ben Franklin! 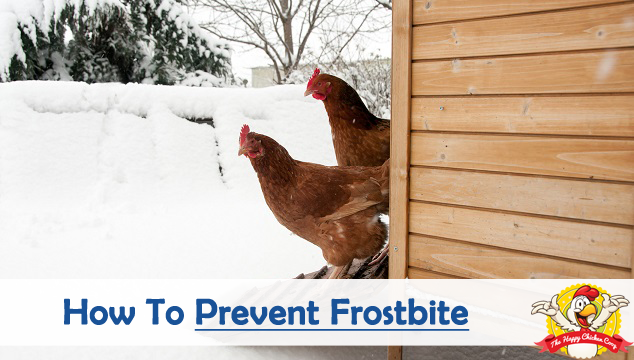 If you can prevent frostbite in the first place, you will save yourself a lot of work and save your hens from suffering. Earlier, we mentioned some of the reasons frostbite occurs. Here we will deal with them individually to see how we can reduce the chances that your rooster or hen will get frostbite. Low Temperature– not really much you can do about this in general. Chickens apparently don’t start to feel ‘cold’ until the temperature hits -20F who knew? They can tolerate low temperatures very well as long as they have a draft free area to shelter in. We have discussed heating the coop in previous articles, but I still maintain that in most cases it isn’t necessary. If you hang a thermometer inside the coop, it will usually read 32-40F. How come? Well, a typical hen generates around 10watts of heat, so multiply that by the number of birds in the house to give you a ‘lightbulb’ number. 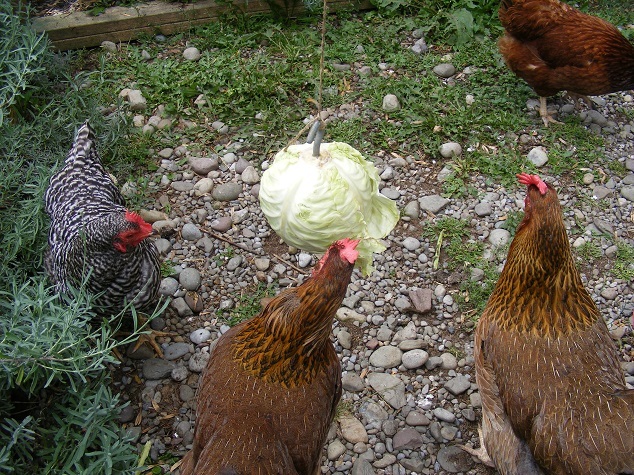 Example: 10 hens each producing 10watts = 100w lightbulb! If you have the desire to heat the coop – please use an oil-filled radiator or wall unit heater, not a heat lamp for safety sake. Moisture– respiration and poop both contain large amounts of moisture. As long as your coop is well ventilated, most of the moisture should be expelled from the coop. If you are concerned about frostbite, you can put Vaseline or a similar oil based cream on the wattles and combs. The Vaseline does not prevent frostbite. It forms a barrier to moisture on the exposed areas. Wind Chill– the wind chill increases the rate of heat loss from the body. The air movement disrupts the ‘boundary’ layer of air around a body, so more heat is lost. Wind chill can be extremely dangerous. The birds need to have a wind free area. You can cover their runs with tarps or plastic sheeting to prevent the wind from whipping through the area. If your coops have gaps/holes, they need to be plugged up to prevent the chilly breeze getting in! Length of Exposure– how long was the bird outside? 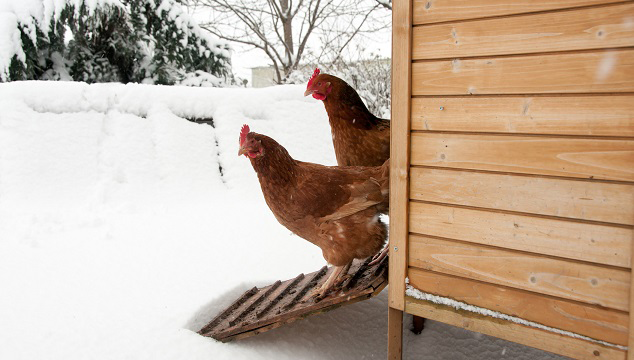 Your hens should always have somewhere relatively warm and draft free to retreat to. Also, walking on snow will chill their feet down considerably. Clearing an area of snow and throwing down some straw onto the cold ground will help to protect their feet a little whilst the hens are getting some exercise. Lack of Shelter– they should always have somewhere covered and dry to hang around in, if the hens choose to go outside in the cold for short periods that’s fine, but they should never be thrown out of the coop for some fresh air. Some people say their birds ‘get into mischief’ if they are inside all day. This can be combatted by providing enough room for them in the first place, the more room the birds have, the less ‘mischief’ you will see. You can also provide diversion therapy such as tetherball, or a ‘rolling’ treat dispenser. 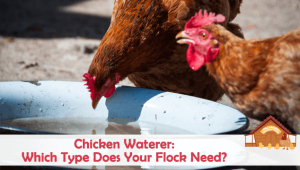 Decreased circulation– in older hens/roosters this can be problematic in the colder months. Simply keep a close eye on your birds and any that seem to have a problem with the cold, try to keep them out of the weather. Despite our best efforts a bird will occasionally suffer from frostbite. Usually it’s a mild case, but sometimes they lose combs, wattles or feet! Although comb and wattle loss is unsightly, it is manageable. Remember that a bird ‘sweats’ through its comb, so temperature regulation is affected, that’s something to be aware of in the heat of summer. Winter is coming- there is no changing that as much as we might wish. 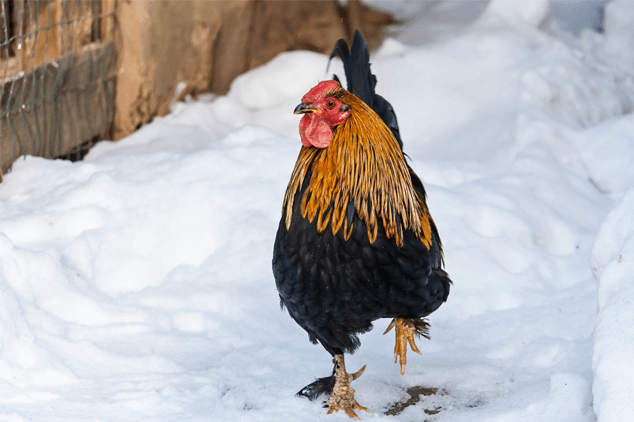 Frostbite can cause long lasting, permanent damage to your flock, so it’s crucial that you prepare your chickens and coop for the winter. Follow the steps outlined in the prevention section above and your girls will be fine this winter! Much of the work of protecting runs with tarps etc. can be done in the slightly warmer months of October and November. Winter time puts extra strain on us all – from carrying buckets of water to the coop to clearing snow for the flock. It also stresses the hens too. The day to day activities they are accustomed to – hunting for bugs, nibbling grass etc. are suddenly gone. It’s up to us to keep them healthy and occupied during these cold days plus warm and comfortable at night. If you have any other ideas for keeping your hens warm and busy during the winter months let us know, we love to hear from you!